Martin Crawford recently launching his book 'Creating a Forest Garden', at the Eden Project in Cornwall. Last week I cycled round to Martin Crawford’s house to interview him. 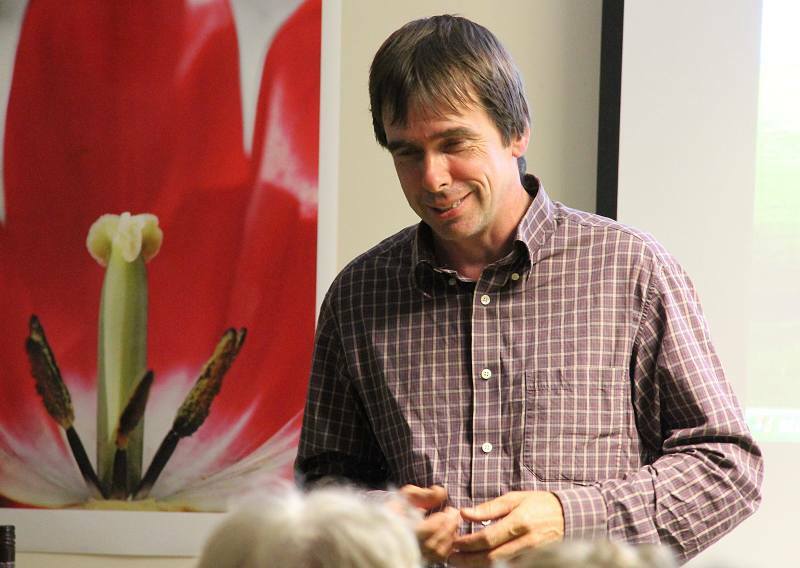 Martin runs the Agroforestry Research Trust, is one of the world’s authorities on the subject, and recently published ‘Creating a Forest Garden‘. I had wanted to ask him about the drought in the southeast and the implications for the future of farming. On the day I visited Martin though it was pouring with rain, but as you’ll see, that made little difference to his thoughts on the matter. I have included a couple of films about his work as well, mixed in with the interview. So Martin, the thing that inspired me to think I wanted to come around and talk to you was the drought situation in East Anglia and the southeast, which has been very much in the news in the last few weeks – although it does seem to be slightly superseded by events, as we sit here with the rain pouring down outside! But I wondered firstly what your thoughts are on that and also what that tells us about farming as it’s currently practiced in that part of the country. Yeah, it’s very easy to look outside and see it’s pouring with rain and think, “Oh, it’s actually fine now”. And it’s even pouring with rain in the east of the country sometimes too now. But it’s not all fine – the damage has been done. Yields from arable crops in the East of the country, (which is where the main arable crops like wheat are grown in this country), are going to be down by at least 25% and maybe more, because the damage has been done. It can’t be recovered – it’s too late for that now. It’s not all fine now and it really shows that a spring like this, which seems to be becoming the norm…..for the last four years we’ve had pretty dry springs – not as dry as this one but it seems to be becoming a pattern. Whether that continues or not, it’s impossible to say. In such a dry spring, the value and resilience of perennial plants is very obvious, so in my forest garden for example where everything is perennial it has been looking lush this spring and not drought affected at all. I haven’t watered anything in there and it’s been absolutely fine. So I haven’t been one of the people complaining about lack of rain all the time – it’s people who are wanting to grow lots of annual vegetables or farmers growing annual plants that have been screaming about the weather because if you’re sowing annual plants in spring, you’ve got to have water – they’re not going to grow without it, and put their roots down and so on. In terms of looking at the future – if we’re going to grow more of our own food as a country and as a region, this is going to have a significant impact. And on a larger, world-wide scale, it’s actually quite bizarre in some ways. If you look at it in an ecological way, it’s quite bizarre we’ve based almost our whole agriculture on annual plants because if you look in nature, annual plants are rare. You only get them if there’s been a soil disturbance, and then for a short time because they’ve been taken over by perennials. So in a sense our whole agriculture is quite unnatural, based on annual plants, and very prone to any kind of climate extremes – whether it’s drought or water-logging from extreme events or whatever. Unfortunately, because of climate change, those extreme events are going to get more and more frequent – all extreme events, not just droughts. Annual crops are going to get more and more susceptible to crop failures as time goes on, certainly in the next few decades. And that could have quite serious effects. In terms of grain stores in the world – grain stores are lower than they’ve ever been because there are increasing failures of harvest in some of the big grain producing countries. Why is it that your forest garden is green and lush while everyone else is having to water their garden – why aren’t you having to dash around there with a hosepipe? It’s partly because the plants are perennial. They’ve been planted several years ago, most of them. They’re well established, they have deep root systems already so they haven’t got to have that constant moisture in the top few inches of the top soil, which annual plants need to get the seeds to germinate and the roots to grow down. So it’s partly that but it’s also to do with the system as well – it’s not just them being perennial plants because even perennial plants can sometimes be prone to drought problems. But it’s the system as well so a forest garden system, or any agro-forestry system with a large proportion of trees in tends to protect the soil from drying influences. So any shade protects the soil from drying; wind speeds are reduced so that reduces the evaporation from the soil as well. Then there’s all sorts of effects that are very subtle and we often don’t ever see – for example there’s an effect called a ‘hydraulic lift’, using a horticultural term, and that is when, in a very dry or drought situation you’ve got deep rooted trees, what actually happens is that they can tap in to water reserves deep down in the sub-soil. For their own use they bring that water up but when it’s very dry a big proportion of that water leaks out of their roots higher up in to the top soil and actually enables some of the other plants to use some of the water that they’re actually bringing up. So there are some really fascinating effects that we don’t know the half of yet because the soil’s a mysterious place and not much research actually goes in to what happens there. But it’s not just plants competing with each other, it’s much, much more complicated than that. If you were an enterprising cereal farmer in East Anglia who was sitting there looking at the yield being 25% down this year and looking at the data about climate change and thinking, “Well, this is where we are now”, what would you do? What would be your advice? Martin Wolfe on his trial agroforestry farm in Sussex. My advice would be to think carefully about what you’re going to do in the future because these droughts are likely to get worse not better as the years go on. If you want to keep growing cereals, then probably the simplest agro-forestry system to do that in is called alley cropping and there’s a guy called Martin Wolfe over in Sussex who does this on his own farm and he grows cereals and does a lot of research as well. And it basically means having lines of trees and alleys of your cereal crops cultivated in between. You still get some benefits from those trees – you get shade, you get shelter benefits, and that will help to some degree. But if you’re still growing annual wheat, say, it is still going to be prone to annual drought problems, whatever tree system you grow it in. I don’t think there’s any way really of getting away from that. The only alternative is to look towards perennial crops and unfortunately, as the last 100 years of agricultural research has progressed, it’s all gone into annual plants – very little has gone into perennial plants. If the same effort had gone into perennial plants, we would now have perennial plants and it wouldn’t live forever but maybe 8 years, 10 years…it would have very deep roots and you wouldn’t have to keep cultivating it and so on. Instead of which, perennial wheat is around – it hasn’t been highly developed but various small organisations have been doing some work on it, particularly in North America. But it’s probably going to be 20 years, 25 years maybe until the work of their breeding and selection comes to a good fruition. So there’s a gap there. Wes Jackson’s working on that. Yes, Wes Jackson and Tim Peters as well – there’s another guy working on that. They’re not working together, they’re doing it independently but they’re both doing some fascinating work. If there isn’t perennial wheat yet and the annual wheat’s buggered, or there’s certainly much, much less dependable, then we’re talking about perennial-based crops instead. So what potential crops are we looking at there then? Obviously the cereals that are grown there are a big source of carbohydrate that feed very easily into an industrial food system – what would be the most viable substitute? Well to take you back one step, I would say that’s not how a big cereal farmer would see it. A big cereal farmer in East Anglia would think, “Well, I need to keep growing big cereal, therefore I need water, not perennial crops. I need water so I can keep the thing watered and keep it growing. And you can surely irrigate wheat – you look in Australia where they grow wheat and they can grow it with masses of irrigation systems if you’ve got the water available.” It could be done – it’s a huge infrastructure thing. We’re not set up for massive irrigation in this country, although we would like to still get plenty of winter rainfall. So if you can store it from winter, you could use it in the summer. In the meantime, I think people are practically likely to try and go down that route if they can get access to water. And it’s naïve to think people will easily or quickly move from a wheat based diet as their carbohydrate staple, to something perennial and more unusual. It might happen slowly and hopefully it will but people are fairly conservative about what they eat and to try and change diets massively wouldn’t be a quick thing. We’re way off walnutabix then! (Laughs) I think we are! 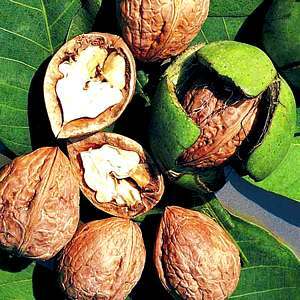 Nuts are an obvious route to take if you’re looking at high energy foods, which are perennial – either carbohydrate nuts like sweet chestnut or oil based nuts like walnuts. Both of them have fantastic potential in this country and elsewhere. If the infrastructure was there to process it – if you dry chestnuts you can then make chestnut flour and that’s an easy ingredient for people to make stuff out of. The processing of nuts on a small scale is labour intensive and that’s probably what puts people off buying more nuts in shells because you have to crack them and that’s a faf – it’s nice doing a few but if you have to do pounds and pounds, or kilos and kilos then it starts to become a big of a drag. It needs those processing facilities to make them more accessible for people to use. It’s not high tech stuff. All the processing equipment is around in places like France – they grow a lot of nuts there – but it’s not around in this country yet because there aren’t enough growers to warrant big equipment, like cooperatives as you see in France. I guess the other approach that you would put forward from a different perspective would be to have some genetically engineered wheat that was more drought tolerant? Yes…..they may well be working on that – I don’t know what they’re doing. I do know they’re trying to introduce the genes for nitrogen fixation in cereals for example, so you have to use less fertilisers – that’s the theory. But I don’t know if they’re working on drought resistant genes, they may be. Frankly, I think the GM route is a red herring. Personally I think there’s probably not that many dangers in GM – there’s a lot of stuff about GM and a lot of people are very frightened about it because it’s relatively untested technology. I think the dangers are probably over rated – I think there are probably not that many dangers. But actually I think it is a complete red herring and a waste of time and effort going down that route because I don’t think that is the answer to solving the world’s food problems, which is what it’s claimed. The world’s food problems at the moment are caused not by lack of varieties of wheat or whatever else – it’s much more complicated than that, socio-economic stuff, food wastage, food miles, all sorts of other stuff that actually, if you could work out all of that, you don’t need GM. It’s irrelevant. In terms of agroforestry, there’s the work you’re doing, there’s Martin Wolfe’s work, there’s other bits and bobs – other individual projects that others have – but in terms of it being able to scale up as something that’s seen more widely as a solution, or part of the solution to the impact that climate change is already having on food production in East Anglia, how might it scale up? How might it take that step across? That’s a tricky one and I work on the smaller end of agroforestry – the intensive, forest gardening type, which is obviously more appropriate to people with their own gardens, or people with small amounts of their own land. Now I estimate there’s between 3 and 400 acres of forest gardens in this country, most of which have been started relatively recently. In terms of larger scale agroforestry systems, and getting them adopted by farmers, that is more difficult. Probably the biggest player of that now is the Organic Research Centre at Elm Farm, which Martin Wolfe is very involved with and they are actually taking a much more pro-active stance towards agro-forestry and putting a lot of research and doing trials – trials of different agro-forestry systems for farmers to go and visit. They’re in Berkshire so they’re not far away from a lot of arable farmers. So perhaps that’s going to have a big influence in the future. The problem with farming is that it’s all got subsidy based and farmers depend on their subsidies from grant schemes via the EU and the Common Agricultural Policy. It’s a great big mess – that’s how it seems to me. A very unhealthy system for farmers to have been forced or enticed onto this system where they feel they don’t have much choice but to do what the bureaucrats in Brussels hand down. For them to start putting in agroforestry systems, half the time they find they start loosing grant money when they do that. Although agroforestry is gradually getting into the European mentality and the CAP, it’s still very patchy and it’s not applied in the same way in every country. So for example, in France with agroforestry systems – if you’re setting one up, you get grant money to do that. You don’t here – we have the same rules but they’re applied very differently. So clearly government has a role here as well because government doesn’t understand what agroforestry is and how important it can be. So if it’s the case that the way to be able to get that very large-scale, intensive farming to move more in this direction, it’s almost that you need political lobbying at that kind of level. And these days when that world is so evidence based, do you feel that after the 15, 20 years that you’ve been doing this work that there is now a strong enough evidence base that could underpin lobbying in that kind of way? Could a case be put forward that’s coherent enough to shift the EU subsidy patterns more in that direction? I think it could, particularly the large scale trials of agroforestry. There have been a lot of these – alley cropping systems and so on – from this country, from France. A lot of research has gone on in France and there’s plenty of evidence out there. I don’t think it’s the lack of evidence – I don’t think it’s that. It’s perhaps a question of who’s going to do it, who’s going to take that on. It’s not going to be me – that’s not what I do! It’s unfortunate that it’s needed in a way because I’m a believer in actually transforming your own life and starting from that basis – affecting others by doing something good yourself. That’s my belief. I don’t believe in big government – I don’t think it’s good in any way to have big government. But we’re lumbered with it and unfortunately somebody’s got to tackle them on it. I don’t know who that’s going to be. You don’t see that push coming from any other bodies? Well, there’s Martin Wolfe and the Organic Research Centre in this country – they’ve done some. And certainly Martin Wolfe has been invited up to the House of Commons on occasion to give presentations about what he does. But last time I spoke to him he said he’d been invited up and not one MP turned up – there were some other people there but it was a room in the Houses of Parliament. So what can you do if nobody turns up to start with… it’s a bit of a problem, isn’t it? If you were able to throw your mind forward 20 years to that part of the country, if actually there had been a shift in policy and agroforestry was supported and enabled……at the moment you walk around that part of the country and it’s just massive, open-prairie style farming – can you describe to us what you think it could be like then? If you were driving along a road you would see masses of trees. It would probably develop into alley cropping systems, mainly I would think. It still wouldn’t look like a natural environment because you’d have lines of trees – not necessarily single lines, it could be multiples lines of trees – with gaps in between with cultivated ground with wheat or other arable crops there. But basically there would be a lot more tree cover as a proportion of the land –there’s almost none in parts of East Anglia now. Going through that area would have a very different feel about it. And the trees, as well as giving some benefits to the arable crops – and trees can be crop trees as well, so they could be nuts for example and as they matured and gave crops, and their crops increased, that would off-set any reduction in yields of cereals. Obviously, as the trees get bigger and bigger, depending on what spacing you put them at, the shade increases and arable crops can’t tolerate very much shade so as the shade increases the arable crop tends to decrease in time. If you’ve got a productive tree, you gradually move from one crop to another and you could end up, after a few decades, with mainly tree crops there. The question I should have asked you at the beginning – it’s presumptuous everyone knows what we’re talking about – could you just give us a little elevator pitch of what agroforestry is? Agroforestry is basically growing trees and crops – lower crops that is – in the same space. It can vary – there’s a lot of different types of agroforestry, so probably the most intensive type are called forest gardens and that’s a very intimate mixture of trees and perennial shrubs and so on, usually on about 4 acres or not much more than that. That’s an intensive form and at the other end of the scale there are extensive forms that are used on a much bigger scale. In terms of arable cropping, it’s usually alley cropping in lines of trees – they may be productive trees themselves like fruit trees or nut trees or maybe timber trees for the future – with cultivated alleys in between where normal harvesting or sowing operations take place. Or you can have, in areas like the west of Britain where there’s not so much arable land and more grassland, you can have trees in pasture, which is sometimes called silvopasture. 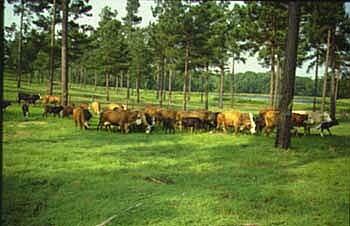 Those trees can have a lot of benefits in terms of benefits to the pasture but also in terms of benefits to the animals that are grazing on the pasture. Because animals actually love having trees around; they love the shelter of trees in hot weather, and perhaps in wet weather as well. Generally, with the extra shelter they get, animals actually do much better than in an open grass field. Old fashioned parkland is a kind of agroforestry system where you have scattered big trees dotted around pasture and that’s one of the very old, traditional agroforestry systems that’s been around or hundreds of years here. So some systems have been around for a while. My final question is, we’re talking about what’s been the grain bowl of the UK having its yields down by 25%, and presumably at this stage, in terms of research around yields and so on, could agroforestry feed the world? If we talk about an allotment on a small scale….an allotment is always talked about as being the most productive use of a small amount of land, can a forest garden on the same size out-yield that? Can agroforestry feed the world? There’s lots of strands to that question. First I’d say the overall answer is yes. Could you have an intensive forest gardening system that yields more per unit area than an allotment? Yes you could. But I would argue that just looking at yields and the maximum you could get out of a piece of land is the wrong way of looking at it. That’s what agricultural scientists have let us down to – everybody looks at what you can get out of a piece of land. Is it enough to feed the country, the world, whatever? From my perspective, that’s the wrong question. The question should be, what can a piece of land provide sustainably, without degrading the environment, without reducing wildlife value dramatically, and obviously still produce useful stuff for people – which is a different question entirely. What a piece of land can produce sustainably isn’t always as much as a field in East Anglia that has chemicals piled on all year round – fertilisers, pesticides, insecticides etc. You probably can’t match that very easily in terms of output, with any agroforestry system. But that’s not sustainable. So it’s a much more complicated question. If you start with the question, ‘What is a sustainable output?’, then that will lead you on to the inevitable question – ‘What is a sustainable human population?’. And that’s the thing that is almost never discussed because it’s a very sensitive topic. But it should be because actually human population can’t go on forever getting bigger and bigger because there’s only so much the earth can provide sustainably. Excellent interview, two very forward thinking minds coming together! The drought situation across much of southern Britain is a huge issue that many – even Transitioners, do not fully appreciate the impact it has/will have on food security. Speaking as an organic vegetable grower, I am very aware that I need to constantly more towards perennials more (and am doing so), but the hard truth is people want to buy annual vegetables – and I want to eat them too!! Annual cultivation is quite an unnatural process that is not very resilient when it comes to soil moisture. In 30 years perhaps we will see a huge uptake in perennials – I hope we do, but the “big change” won’t happen overnight, or even in 5 years, it just won’t. Meanwhile we need to pay very careful attention to organic matter levels in our soils, hold on to what moisture we have from rain as long as possible and time our sowing and planting dates very carefully. Oh, and an accurate three month weather forecast would be helpful please Met Office! Agroforestry may be outside the targets at the moment for the biotech industry, but if (hopefully) it takes off …. For Transition Towns, we need to be emulating what Martin is doing, locally – with our own forest gardens and plant nurseries. Any growing project should aim to be dominated by perennial, low-maintenance plants. Maybe around 10% for annuals including nasturtiums and marigolds? We need to lengthen our timeline when we’re planning/adapting gardens. That’s why we’ve started a plant nursery in London (Edible Landscapes London) that is propagating and selling these kinds of plants. There is already a growing demand for (unusual) edible perennials and we wanted to be able to source them locally, learn more about caring for them and raise awareness of them. (Don’t forget that lots of perennial plants aren’t unusual – all the fruit and nut trees, rhubarb, artichoke, some types of chard etc.) The information about what plants we’re growing and how we’re doing it is mostly on our website and we’re happy to talk to people about what we’re up to. Martin is an unrivalled and excellent source of information. What doesn’t come across in this interview is the amount of attention he pays to the taste of his crops, his true love of eating them. Whatever plants you get from him are the best ones from ALL the ones he has painstakingly trialled. And there’s nothing like eating something unusual straight of the plant, to convince you that it’s worth growing yourself. Everyone interested in gardening should pay a visit to ART. For more on the fabulous Wakelyn’s project in Suffolk see http://www.wakelyns.co.uk/ The Farm Woodland Forum is meeting there this week, so it will be interesting to see how Martin Wolfe’s crops are doing in the drought. For anyone coming to the Transition Conference in Liverpool, I will be leading a Tree Walk on Sunday evening looking at Trees for Transition in an urban context. To play devil’s advocate: When Martin says “The world’s food problems at the moment are caused not by lack of varieties of wheat or whatever else – it’s much more complicated than that, socio-economic stuff, food wastage, food miles, all sorts of other stuff that actually, if you could work out all of that, you don’t need GM. It’s irrelevant.” could the same not be said about agroforestry? I have heard agro-forestry practitioners claim overall yields about 1.3 times that of growing trees and crops separately. It is a benign form of intensive farming, as demonstrated by Martin Crawford’s project. Furthermore, if we want to increase tree cover (which we do for a whole host of reasons like carbon management, environmental protection, biodiversity, timber, woodfuel), then accommodating trees in agricultural landscapes can benefit everyone. Jonathan is absolutely right – it is naive to think that people are going to give up eating (and growing) annuals very quickly. Most people are conservative about what they eat and presented with a tray of bamboo shoots will throw up their hands and scuttle off. But the transition to perennials has already started and although it will be slow and bumpy, I think it will continue. There will always be some annuals grown too. Re skintnick’s comment, I would say that in the decades to come, climate change is going to cause so much disruption to the growing and distribution of food that we need agroforestry as a stabilising influence almost everywhere. Re the drought…this video shows that restoring trees will increase rainfall, at least in the tropics. This is one of the best TED Talks I’ve seen. I tweeted (poked) a message at DefraUKgov yesterday – not sure what their response would be/ or even, if they’ll bother to respond at all? And isn’t that a big part of the problem? …a distinct lack of response. Very nice to have the work of Martin Crawford highlited. His research is very important and forward looking. Of course other people could try to replicate Martin’s research strategy, and adapt it to their location. Martin’s recent book on forest gardening offers a lot of practical advice. Just want to say thankyou for showing a group of us – including me – around your Forest Garden at Dartington earlier today. It was so very interesting and encouraging to think that we can eat so many plants. Their tubors, fruits, leaves etc. With your enthusiasm – so very obvious – I will start converting more of my garden to grow perennials rather than annuals without delay. I already tend to grow plenty of ground cover, but will take hints from your garden on that aspect too. Many thanks for your time. you might as wel say “we dont need polytunnels- they are red herring! 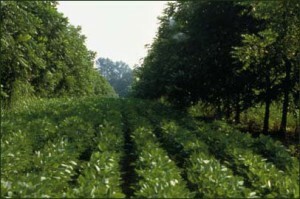 we need agroforestry!” GE is just one of many ways of producing better seeds. It is spreading rapidly around the world and has the capacity to really address eg disease problems that cannot be solved by conventional techniques. Agroforestry is important but GE is far more important and is already feeding far more people.